Meowga Monday KonMari Kitty Japanese Style by Clyde, feline editor and curious cat. Are you as curious as a cat? Well, curl up with me and you might learn something new. 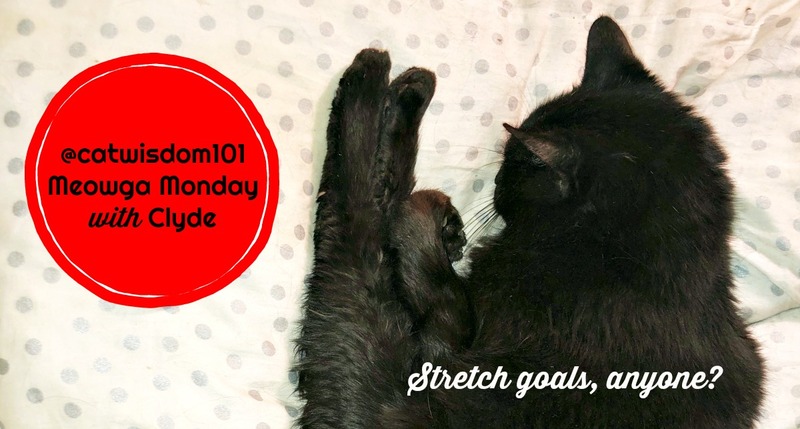 How about doing a good stretch for starters? It’s #Meowgamonday. Yeah, it’s my thing and a thing on Instagram. #goals. We can’t let all you yoga buffs have all the fun. Speaking of goals or stretch goals, no pun intended, I have a humongous one for you. Have you been swept up into the KonMari world of Marie Kondo, the declutter queen? She’s sold millions of copies of her book and Layla binge watched her new series on Netflix. Addictive but no substitute for actual tidying up. Apparently she’s not the only one hooked on the magic. 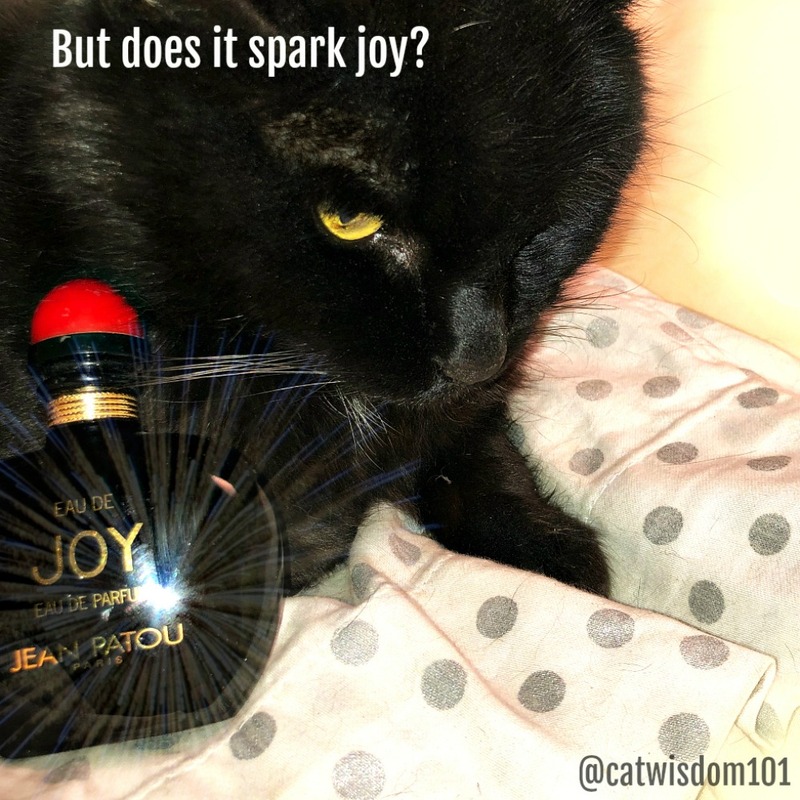 It’s all about getting rid of what no longer sparks joy. I’ve seen nothing about Ms. Kondo and her feelings about cats or the challenges of keeping a multiple cat family home clean. Hello, cat hair and too many cat toys. I guess she would suggest putting them into cute baskets or containers. But really, does she think they are going to neatly stay there? All I care about is whether my cat bowls and cat litter are clean and no where near each other. Have you done any KonMari tidying up in your home? I’ll tell you what this cat thinks about things. Humans use, consume, collect way too much stuff. If cats could shop, they wouldn’t buy things. We know money can buy material things but not love or happiness. Okay, we might spring for a jar of caviar on occasion but you’d never find a cat hoarding garbage found on the street. Yes, you might find a stash of catnip mice under the sofa but only because you keep buying them and not vacuuming properly. May your cat spark much joy but not so much that you become a hoarder. I hope your done you’re tidying up because it’s bad luck to clean your house on the Chinese New Year which begins later today. Happy New Year! It’s the year of the pig so will you be tidy or a little piggy this year? Black Cats Tell All or do we? I’ll never tell. We need to maintain an air of mystery but want you to tell us something in a comment. Or share an image or the whole post. We are just not neat freaks, like Summer we think a bit of clutter makes for home. 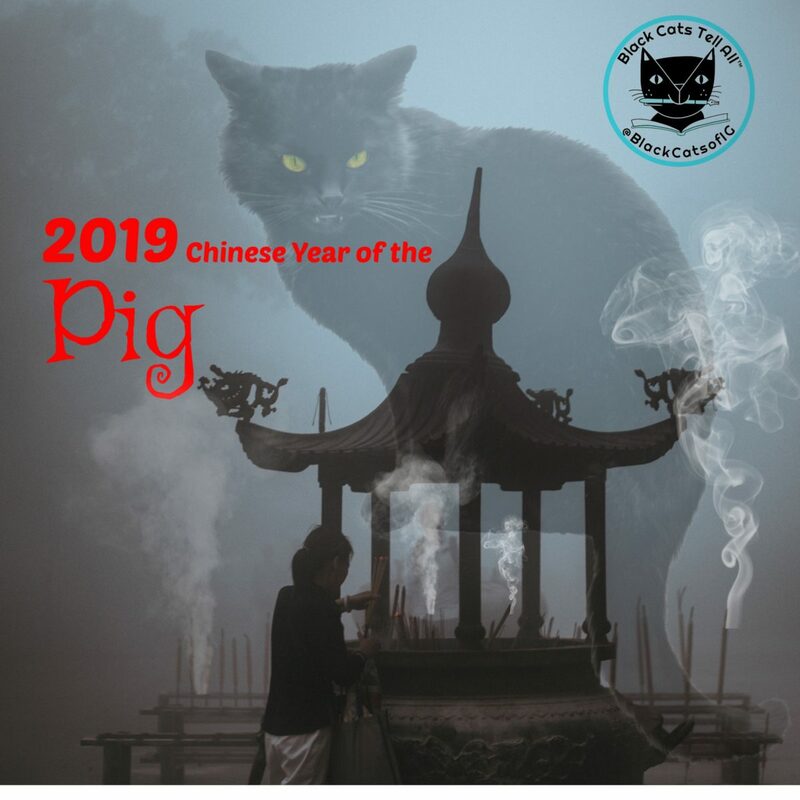 Luvs to all and the happiest year of the Pig. True about the homey feeling. No minimalists here! You may want to read up on the year of the pig since you’re one. Konmari method would be a bit harsh for us. We actually do have plans to declutter but life and stuff get in the way. Things like fixing the roof (we do all the work ourselves still) and just life in general surviving. The other part is we reuse, recycle & reduce. We have been in too many situations here the minute we remove something, it i something we or someone else needs very soon. It is odd. 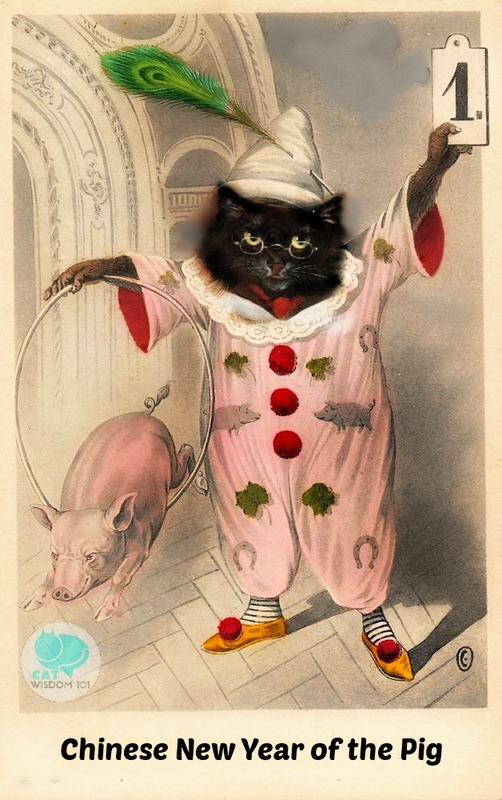 Happy year of the Pig, Clyde you are looking good buddy! Happy Chinese New Year! I am all for having less stuff, but I will never declutter my cats’ things. I only get rid of something if it is damaged beyond repair like old cat trees with the carpeting falling off. Cheddar here, Oh my cheese! Mao would have loved this. But Magic went his way, and I’m here. maybe I can teach Mawm Marie Kondo. just finished 2 hours in the clothes closet!!! Returning again tomorrow! Can’t use the Konmari method of taking all the clothes out and then putting them back cause we have too many cats who would love to get right into that pile! 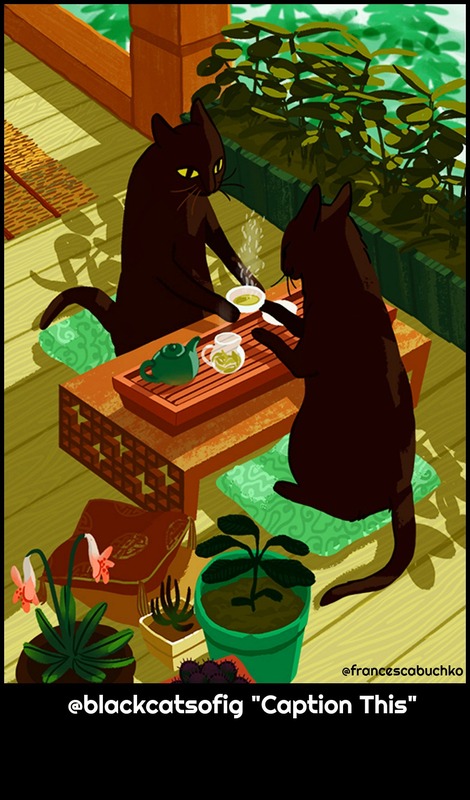 I love the picture of the cats taking tea. I am naturally tidy and always have been so never have anything to de-clutter. I am not obsessive about it but like everything to have it’s place. Of course that didn’t include Eric and Flynn. They had their toys and their beds and were allowed to get away with everything. My human is not big on decluttering, which anyone who has been to our house might know! She likes a bit of clutter and disarray, as it make her feel comfortable and gives life to the house. Her two cents. I would have never guessed. Your photos look uncluttered but I guess the mess is out of frame. All kinds of cool stuff today – thank you! 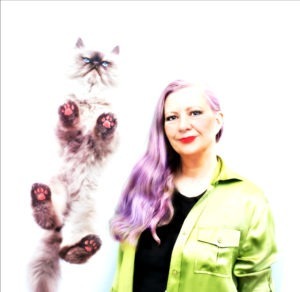 The Francesca Buchko image is darling! None of my cats are that polite, one waiting while the other serves, but it’s a wonderful image.